Learn how to identify resistor values using their color coded bands. Handy resistor color code chart inside CD. This resitor color code CD course introduces the concepts of electronics by using detailed diagrams, step by step electrical operational procedures, animations and user feedback through quizzes and tests. It's a complete interactive method of learning that's great for beginners or advanced electronics professional. Requires a PC with Windows XP or newer. 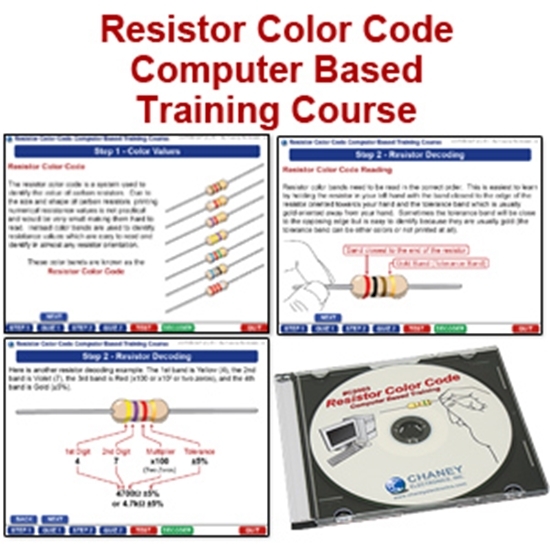 How do I order the Resistor Color Code CD Course? 2. Or you can call us at (800) 321-2155 and ask for product 02-753.